Nowruz celebration held at the senate building in Washington D.C. Picture shows a few of the speakers at the ceremony, from left Ambassador Lincoln Bloomfield, General James Jones, Governor. Tom Ridge, and Senator Joe Lieberman, being welcomed by organizers of the gathering. 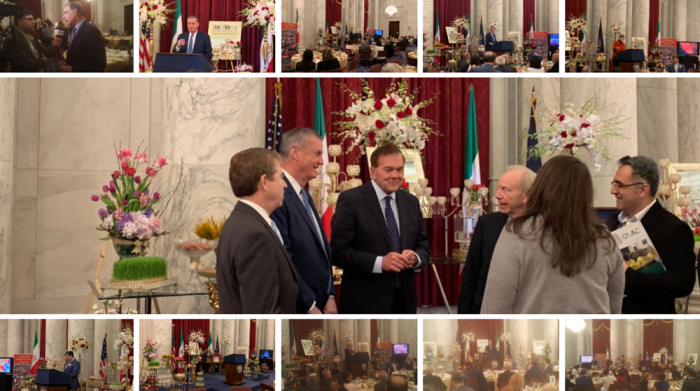 In an event ahead of the Persian New Year celebrations, US senators gathered in the John F. Kennedy Hall in Washington D.C. to participate in a discussion on Iranian human rights abuses and the future of democracy in Iran. Senators from both sides of the political aisle came together with dignitaries to discuss the necessity of offering support for the Iranian pro-democracy opposition. The People’s Mujahedin Organisation of Iran (MEK) and the leader of the Iranian opposition, president-elect Maryam Rajavi, are the only viable democratic alternative to regime rule in the country. Rajavi’s ten-point plan for restoring democracy to the country following the fall of the clerical regime has drawn international support and attention. The senators also discussed the regime’s ruthless demonization campaign and dissemination of misinformation in an attempt to turn public opinion against the influential opposition group. Among those at the meeting calling for increased support for Ms Rajavi and the MEK were Senator Jeanne Sheehan of the Foreign Affairs, Armed Forces and Budget committees, John Boozman of the Subcommittee on Military Construction and the Veteran Affairs committee, Former National Security Advisor General James Jones, former Vice-Presidential candidate Joseph Lieberman, Governor Tom Ridge, and Lincoln Bloomfield, the former director of the State Department Bureau of Political-Military Affairs. Think tank fellows, Middle East experts and a slew of reporters from mainstream media outlets were also in attendance. Jeanne Sheehan made the case for supporting the MEK to normalise Iran’s relations with other states in the region. The Iranian regime has systematically funneled weapons and finances to militia groups and terror cells across the Middle East. Its Islamic Revolutionary Guards Corps (IRGC) and Quds Forces have been involved in the civil wars in Syria, the Yemen, Lebanon, and Iraq. Its financial support for terror groups like Hezbollah and Hamas have undermined regional security. Sheehan called for the peaceful coexistence with other nations in the Middle East. 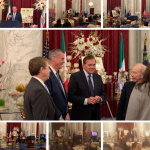 When Senator Boozman took the floor, he highlighted the growing support and popularity of the MEK and the Iranian resistance as a major reason why the US government should lend its support to Ms. Rajavi and her opposition to the clerical regime. For General James Jones, the regimes continued terrorist plots against the Iranian opposition abroad were a major factor in his decision to call for increased MEK support. In 2018, the regime coordinated terror attacks against MEK members in Albania, France, and the US. In one of the highest-profile attacks, a Belgian Iranian couple was arrested en-route to the MEK’s annual Grand Gathering event in Paris with a car laden with explosives. More than 100,000 supporters attended the event. Had the plot been carried out, the loss of life could have been catastrophic. Senator Lieberman highlighted the importance of lending US support to the opposition at this moment. He described how the regime is in decline. Factional infighting, US sanctions, and a growing internal protest movement within Iran are putting the regime under immense pressure. The cracks are appearing and the MEK is ready to fill the void when the regime buckles. All the events speakers were unambiguous in the need for US support of the MEK. With the regime’s future in power becoming more uncertain by the day.